Compared to AIA letters issued during Obama's election, CEO Robert Ivy's statement on Trump is far from "business as usual"
Welp, that was fast. On yesterday's episode of Archinect Sessions ("#89: AIAWOL"), while discussing the recent fallout over the AIA's statement pledging support of President-elect Trump, Paul sent out an open call to listeners: send us any other statements made by the AIA in response to a prior presidential election. Within hours of posting the episode, the AIA responded with two statements: one from President Obama's election in 2008 (dated 11/24/2008), and one from his reelection in 2012 (dated 11/7/2012). 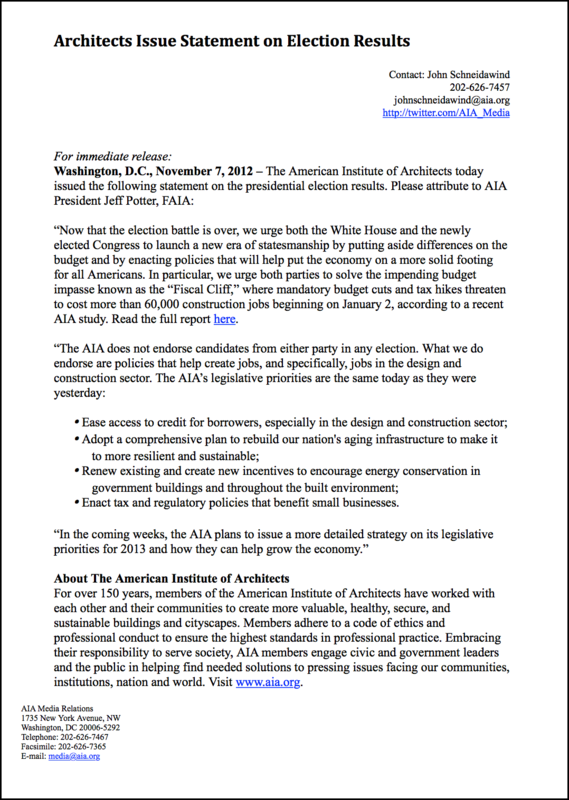 While all three statements appear, on their face, as form-letters expressing that the AIA will work with the President-elect insofar as their usual role demands, the 2008/2012 statements differ in a few key ways from the one AIA CEO Robert Ivy made in the wake of this year's election, provoking outrage among members. For one, neither the 2008 nor 2012 statements are signed by any one person—they quote from the concurrent AIA President or CEO, but are not issued as if directly from a top official's pen. That the 2016 letter came with Ivy's explicit authorship infuriated many AIA members on the principle that it was undemocratic, by issuing such a statement on behalf of dues-paying members without querying them first. Secondly, Ivy's letter drew flak for its blanket support of a President-elect whose campaign has been, to say the least, remarkably controversial. The campaign issues specific to the AIA's concerns include Trump's promotion of discriminatory policy through infrastructure (including the "border wall" and "a long history of racial bias at his family’s properties"), alleged short-shrifting of his architects, and his outright denial of climate change as a "hoax". Many members found these issues damaging to the profession, and were frustrated that Ivy's statement didn't address them. Insofar as how these statements convey the AIA's goals for the upcoming Presidential term, Ivy's letter expresses its pledge to work with the President-elect in a general sense, rather than only referring specifically to principles that the AIA already advocates for—something that the 2008/2012 letters do far more carefully. For example, Ivy's statement began with (all emphasis ours): "The AIA and its 89,000 members are committed to working with President-elect Trump to address the issues our country faces, particularly strengthening the nation’s aging infrastructure." By contrast, the 2012 letter addresses only "the White House" and Congress: "Now that the election battle is over, we urge both the White House and the newly elected Congress to launch a new era of statesmanship by putting aside differences on the budget and by enacting policies that will help put the economy on a more solid footing for all Americans." In similar form, the 2008 letter begins with: "The American Institute of Architects (AIA) has offered to assist President-elect Barack Obama advance his goals of promoting green buildings and focusing on the needs of urban areas." 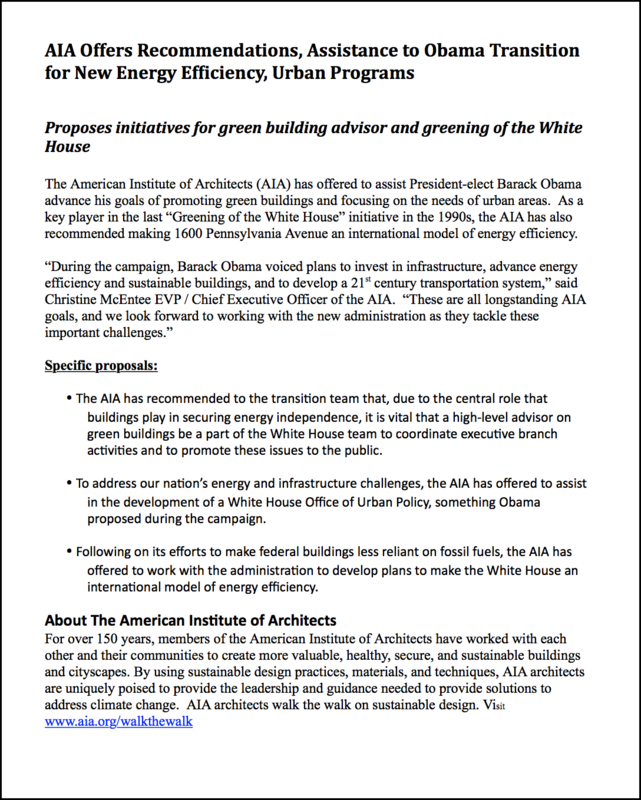 Both the 2012 and 2008 letters also refer to relatively specific proposals that the AIA can work on with the incoming administration, including: “Greening of the White House” initiatives, establishing a White House Office of Urban Policy, and endorsing policies that help create design and construction jobs. Ivy's letter mentions working to realize Trump's campaign promise to strengthen U.S. infrastructure, but with no further specification, it's impossible to know whether this was an endorsement of the border wall. While these comparisons may seem like splitting hairs to some, the differences in the statements' exact wordings mean far less than the presiding political context in which they were issued. A "business as usual" form letter might have passed unnoticed by AIA members during Obama's reelection, but in the midst of Trump's contentious and rule-breaking campaign (where he was called "unfit" to be President by the incumbent), the AIA's failure to speak out against Trump then can be read by many members as a tacit, wholesale endorsement, banally acquiescing to policies that run directly counter to the AIA's values, such as sustainability in the face of climate change, and equitable design. The AIA's statements from 2008 and 2012 are reproduced in their entirety (and sequentially) below. Hmmmmm...I'll quote what was written, or paraphrase, to me today, "this appears to me that they are telling the incoming administration what they should do". The cynic in me wonders, it's that because white men have a habit of thinking they know better, or have a propensity for telling black men what they should do? mr. ivy must be looking for a cabinet position. The 2016 statement, in issuing blanket support for Trump's "infrastructure plan," falls into the trap identified by Obama adviser Ronald Klain in a Washington Post Op-Ed (https://www.washingtonpost.com/opinions/trumps-big-infrastructure-plan-its-a-trap/2016/11/18/5b1d109c-adae-11e6-8b45-f8e493f06fcd_story.html?utm_term=.8e8fd261b97f). Rather than offering, as the 2008 and 2012 statements do, specific points about the values and goals that the AIA advocates and the means by which the government can achieve those goals, the 2016 statement perpetuates the sham.